Cat eyes are interesting on a number of levels. It is always interesting to speculate what other humans see, for instance. So what do cats see? Although in her 80s (in human terms) my cat, Binnie, seems to have good to excellent eyes. She can recognise me from a considerable distance. But what does she actually see? Is her eyesight as good (or as bad) as mine? Cats are meant to see better at night – is this true? Well cats have some special features about their eyes that are rather uncommon. They rely on their sight which is adapted for hunting5. A cat’s eyes are very large, so large in relation to their head size that if we had them they would be 8 inches in diameter!5 For some wild cats this is particularly noticeable. I am thinking of the tree climbing Margay. The clear part of the eye that we can see is the cornea. It is covered by transparent cells and surrounded by a white rim, the sclera. The conjunctiva is a layer of tissue that covers the white of the eye. Cat do not usually have eyelashes but when they do they can cause irritation to the eye’s surface is they are malformed. Tears are secreted by glands in eyelids, the third eyelid and conjunctiva. They cleanse and prevent infection. Tears evaporate and drain via a drainage system near the inner corner of the eye. It is almost universally found that the flat faced Persian has defective drainage ducts due to the unnaturally formed head shape (see Persian cat health problems). See also clogged tear duct of a cat. The pupil is the aperture in the centre. The iris is the coloured part of the eye that changes shape to form a larger or smaller iris. There is pigment in the iris that causes the eye colour. Odd-eyed cats (see below) can be deaf as is the case for the all white cat with both eyes blue5. Eye colour forms part of a purebred cat’s breed standard. Siamese cats always have blue eyes. See deaf cat. Inside the eye there are two chambers; the anterior and posterior chambers. The anterior chamber is just behind the cornea and inbetween the rear of the cornea and the lens. The posterior chamber is between the lens and the retina and contains a clear jelly. The lens focuses the light in the same way as a camera lens5. I was told that cats can’t see color. There is still work to do on this subject. In fact there is still a lot to do on understanding our fellow creatures on this planet. Over and over again we are discovering that animals can do m ore and think better than we ever imagined. For many years “experts” were convinced that cats saw everything in shades of trey. Not so apparently. More recent tests indicate that cats can see colour. A cat can tell the difference between certain colors such as red and green (two primary colors) and red and grey for example (read on, however as cats cannot see red or see it badly). The indications are that they don’t have the full range of colours that humans have. This is in part due to the lower density of cones in their retina (see below). It is said that the cones in a cat’s retina are sensitive to light that produces the colours, green and blue; shorter wave lengths to red to which they are less sensitive1. It is said that a cat has a form of dichromatic vision as cat eyes are sensitivity to green and blue, two colours1. It is not clear why this adaptation has come about. However, a cat’s survival in terms of vision is about detecting movement in the dark and its eyes are very efficient at that. But who’s to say that we see everything that there is to see? The thing is though that as cat eyes are built to see better in the dark and in darkness there is less color anyway because there is little or no light shining on the object for the color of the object to be reflected outwards. Cat eyes are much more developed for seeing in low light levels, when things look grey even to us. Cat eyes are also well set forward on the head1. This allows for a wide view of about 120º for the cat’s binocular vision. To the wide field of view can be added an additional 80º on each side of lateral vision1. However, the eyeball is recessed and deep-seated, which restricts eye movement. The cat compensates by using its lateral vision to detect the movement of prey and turning its head rapidly to face it. A cat is less good at detecting stationary objects and will wait patiently, watching with a steady gaze5. The cornea of cat eyes protrudes from the head (see photo above left). The also helps with field of view. The binocular vision is vital to depth perception. Sometimes we see cats enhancing the gauging of depth of moving their heads from side to side before jumping. This displaces the target object allowing for a more accurate judgment (see Cat swaying and jumping ). cat eyes have a reflective-like layer behind the retina which reflects the light back to the retina boosting the amount of light it receives. This layer is called the tapetum cellulosum or tapetum lucidum. This layer picks up light that was not absorbed by the retina’s receptors and so gives the cat a second chance to see objects. It’s the reason why you get laser eyed cats when you photograph them with the flash on the camera. The light from the flash goes into the eye and bounces straight back into the camera lens looking as if you’d photographed a mirror like material. This is sometimes called “eye shine”. cat eyes have a high proportion of rods in the retina and a lower number of cones. Rod cells, or rods, are photoreceptor cells in the retina of the eye that function in less intense light compared to the other type of photoreceptor, cone cells2. Cone cells, or cones, are photoreceptor cells in the retina of the eye that function best in relatively bright light. The cone cells gradually become sparser towards the periphery of the retina2. See: Are Cats Color Blind? These factors allow a lot of light onto the retina when the pupil is at maximum aperture and the amount is similar to that of nocturnal animals such as bats or badgers1. However, there is a trade off. Although cats can see in very low light they have a reduced ability to see fine detail and a reduced ability to see fine differences in colour. Humans are diurnal (active during the day) while cats are crepuscular (active at dusk and dawn and nocturnal in fact). A cat’s maximum retinal illumination is about five times that of the human1. Apparently a cat will see the same degree (in terms of brightness) as humans in one sixth of the available light. Cats tend to be Hyperopic (longsightedness). This a defect of vision caused by an imperfection in the eye causing difficulty focusing on near objects. Please note: Linda P Case in her book The Cat states that cats are considered to be slightly “myopic” saying that they cannot focus on near objects. Animals with myopia see near objects clearly but far away objects appear blurred3 so I judge her comment incorrect. It is said that this poor close focus is due to weak muscles that change the shape of the lens5. The equivalent problem is found in people in middle age when trying to read, for example. One way the cat compensates is to “stop down the iris to a smaller aperture (pupil) creating a greater depth of focus5. In the cat that means the iris forms a slit. Photographers will know what I mean. I have noticed that my cats miss some food in their bowls that is at the edges. They also use their acute sense of smell to cover up this slight defect. At close range I notice that cats use smell over sight to “see”. Apparently cats see best between 7 and 20 feet away1. With humans, when the inside of the eye reflects light you get “red eye”. The red is due to the blood feeding the retina, the color of which is reflected back to the camera lens in the same way. I know you’ve seen this, as I have, but probably haven’t thought too much about it. Our eyes have round apertures through which the light passes to the retina where the light is captured. The aperture (the pupil) size can be controlled to control the amount of light received. When it is really bright we tend to squint as well. This reduces the light entering the eye further by, in effect, reducing the aperture further. Cats are better at this than us. Their aperture is a vertical slit, which narrows to control the light passing into the eye. Further control can be effected by closing the eye lid. This has the effect of drawing a blind down over the slit blocking light passing at the top and bottom of the slit. Fancy stuff indeed, but they need this facility due to the extra sensitivity to light as described above. This tells us that cats are nocturnal hunters. In the UK, for many years during the 1950s to 1990s we had centre line road markers called “cat’s eyes”. The science behind these was based on the cat’s reflective eyes. This is called a nictitating membrane and is common to other mammals. The cat has this additional membrane situated between the eyelid and eyeball and at the inner corner of the eyelid. You can see it when a cat falls asleep with their eyes slightly open although it is not easily seen as it is not prominent in a healthy cat. Also when the cat blinks it closes diagonally across the eye. It is also called the “haw”1. to provide additional protection to the eye, when, for example, the cat is walking through undergrowth. to contribute to tear production. to help restore the tear film that is over the eye. This happens when the cat blinks1. As a cat does not blink that much this extra facility assists. It acts much like a car windscreen wiper sweeping across the eye. Odd eyed cats – one blue and one another colour is due to the actions of the piebald (whiting gene) and another gene called the dominant white. I have written about this on the blogger site: Odd-eyed cats . Odd-eyed cats are associated with deafness. See deaf cat. Siamese cats are known for being predisposed to suffer from a squint (the eyes not pointing forward in alignment but turned inwards, often). Definition courtesy NHS: A squint is a condition where one eye turns inwards, outwards, upwards or downwards while the other eye looks forwards. 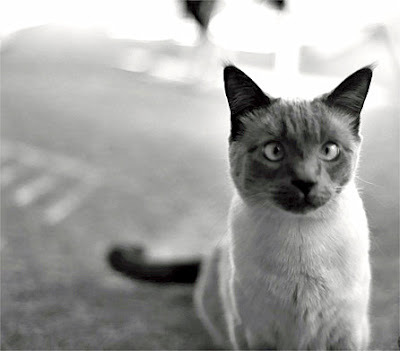 This is thought to be due to the fact that Siamese cats have fewer crossed nerve fibres in the optic nerve. Crossed nerve fibres are nerve fibres from each eye that cross over in the optic chiasm and which then stimulate the brain. The reason for the crossing over is to allow for stereoscopic vision by comparing the two slightly different points of view coming from each eye1. Definition Optic Chiasm: the part of the brain where the optic nerves (CN II) partially cross. The optic chiasm is located at the bottom of the brain immediately below the hypothalamus4. It is thought that Siamese cats see less well stereoscopically. Breeders are required to breed this defect out as it is frowned upon in the show ring and would no doubt lead to disqualification or a loss of points. 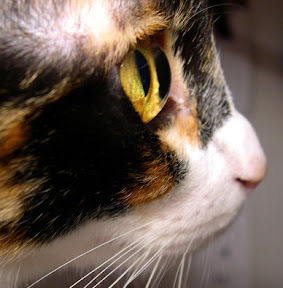 This entry was posted in Cat Anatomy and tagged cat anatomy, cat eyes by Michael Broad. Bookmark the permalink. My newly adopted cat is a one year old Manx mix. Her eyes look odd to me- like they always have that shiny yellow reflection to them, the black part of the eye almost never looks pure black. No matter what time of the day, from almost all angles of view. Any idea what might cause this? So, it doesn’t matter what are the real color of his eyes? I have seen many cats eyes are colored like green or blue. My cat’s eyes color is pretty dark. I thought that was the problem which his eyes are not bright in the dark. My friend had a cat, i had have seen his cat’s eyes are bright at night even just in a dark living room. Hi Amos. It doesn’t matter about the color of the cat’s eyes. They all have the same reflective layer at the back of the eye behind the retina called the tapetum lucidum. It reflects light back to the retina to boost the amount of light that the retina receives. The eye color is pigment in the iris. hi , i have a black kitten is about 11 weeks old,. but his eyes are not bright at night and in the dark, so i almost stepped on him everytime when he was in the dark. my question is how come his eyes are not bright? are they going to change when he gets older? Hi Amos. What is happening is that there is no light source shining into his eyes. His eyes are bright at night but it needs a light to hit the back of the eye at the correct angle. So if he is outside at night and you shine a torch from say 20 yards away (a good distance) into his face you should see the reflection from the back of the eye provided the light rays enter the eye perpendicular to the eye. You only see that bright ghostly light from a cat’s eyes at certain angles: both for the person looking at the cat and the light entering the eye. Thanks for visiting and asking. My Siamese cat can’t see at all in daylight, she falls off the porch, runs into the fence, she can only go outside in the evening or cloudy days, whats wrong with her? She has blue eyes. Blue eyes have irises that have very little or no melanin pigmentation. That means they let in more light. Ordinary sunlight is probably too bright for her. Have you watched her eyes in bright light? Do the pupils close down to a slit and does the eyelid close over the slit? It should do and the pupil should narrow. If it doesn’t I would have her sight checked out. The light may still be too bright for her because light is getting through the iris and hitting the retina. This may be causing discomfort or making it difficult to see. Conclusion: her eyes are letting too much light. That is my guess but always see a vet if in doubt. Good luck to you both. My mother has a cat whose eyes never show the “slit” most cats eyes do. The cats pupils are always round. Is this normal? In my opinion it is not normal unless the cat is permanently in dark places or where the light is subdued. If he is in normal light then it means to me that his iris is not closing properly. This may be due to partial blindness. A typical disease that causes this is retinal atrophy. But I am guessing. I’d check that the iris responding to light. Cats hide blindness very well. He may not be blind though. thank you very much, I will check that out! my cat has amber colored eyes this might be a stupid question but her eyes look like the eyes of the lions i see on tv is it possible she has lion in her blood?